Sabrina (Audrey Hepburn) being driven by her father (John Williams) to sail away on the S.S. LIBERTE. This is one of the final scenes from Paramounts SABRINA directed by Billy Wilder in 1954. 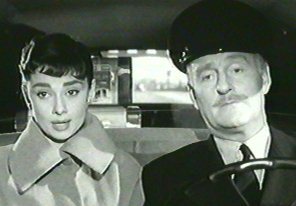 Sabrina Fairchild ( Audrey Hepburn) is seated in the front seat of a limousine with her chauffeur father (John Williams). Audrey is being driven into New York City to board the French Line’s LIBERTE for a one-way first class passage to France after being dumped by Linus Larrabee (Humphrey Bogart). Sabrina’s father works for the Larrabee family. Linus was suppose to join Sabrina on the trans-Atlantic sailing from New York to Europe but reneges at the last moment leaving a heartbroken Sabrina. The LIBERTE ready to sail. But eventually Linus does join Sabrina aboard the LIBERTE – through the prompting of David Larrabee (William Holden). The ship has sailed but Linus boards a family owned tug and sails into New York harbor to the LIBERTE to join Sabrina. This scene was repeated (or stolen from Billy Wilder) in FUNNY GIRL when Fanny Brice (Barbara Streisand) sails aboard a New York Central tugboat to join her future husband. Director Billy Wilder was a patron of the French Line and sailed aboard the LIBERTE, the FRANCE and the ILE DE FRANCE many times. 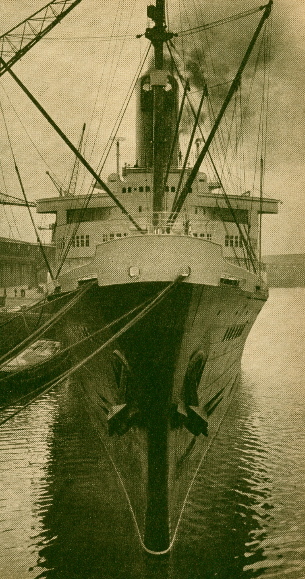 The S.S. Liberte was originally the S.S. Europa. She was the pride of Norddeutscher Lloyd Line in the 1930s. She was the sister ship of the S/S Bremen. Sadly the Second World War caused an end to her years in German hands and she was handed to the French as war reparations. 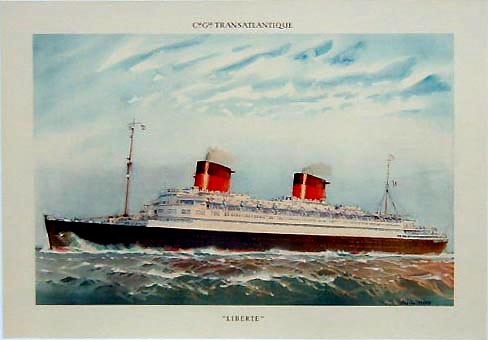 As the S.S. Liberte, the ship Sabrina sailed away on became the stop gap flagship for CGT French Line as a replacement for the legendary S.S. Normandie that had been lost during the Second World War. She was transformed into the pride of France and finally was retired in 1961 after serving two great nations. A newsreel scene taken from the new liner S.S. France of the S.S. Liberte passing on its final trans-Atlantic voyage in 1961.